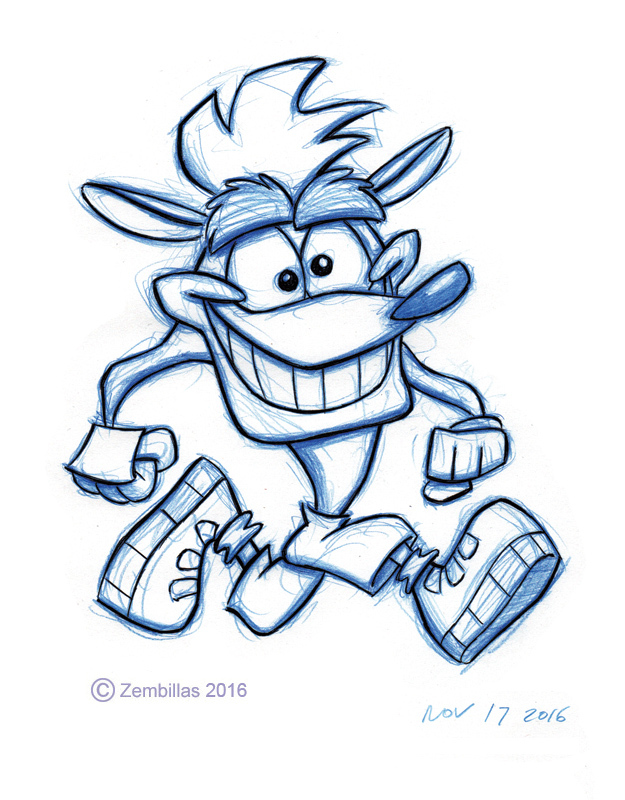 I love the drawings of Crash Bandicoot and I am glad Crash is back Vicarious Visions have done a good job and I am looking forward to the remaster. I wondered if I could ask you a question what was like working on Crash Bandicoot and Spyro the Dragon?. 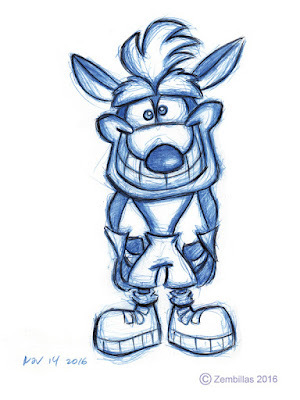 I love to come here and see new Crash(or Spyro) drawings! He looks so cute in the middle one, I feel like giving him a pat on the head. You'll never know how much this made me feel better. After a horrible and unexpected experience, this has made me feel better. Thank you for updating your blog Charles. Dingodile is a fusion of a dingo and crocodile, so how did that work? Did Coretx use a machine to fuse and then mutated them?? fantastic Crash's! I do like the middle one. 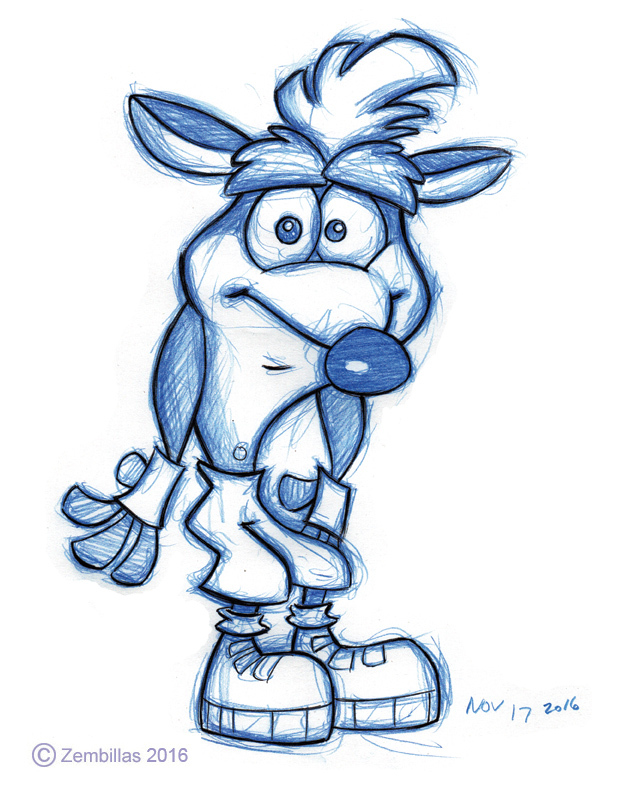 thought of doing some drawings of Crash with different expressions and emotions. I'd be interested to see. Hi Stephen (Crash4563). Working on Crash and Spyro was always fun and exciting. A good experience while the projects were taking place. RubbberRabbbit2 - Yes, he can use a pat on the head in that drawing. Poor guy looks forlorn. Vanilla Latte - Glad the sketches made things a little better for you. As far as the ideas for Crash that was pretty much Naughty Dog and Joe Pearson. My involvement was mostly along the lines of visually defining what they were coming up with and helping to bring those ideas to life. They would tell me what they had in mind and I'd take it from there. 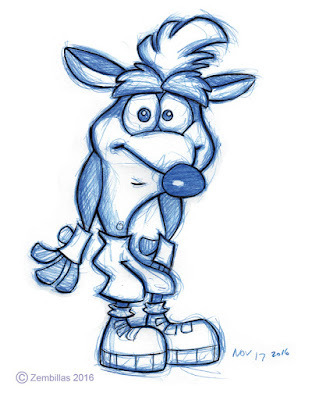 Hazman why not try drawing Crash and see what you come up with. Hey Charles, it's me Pat! Long time no see! Hey there Pat! Hope everything is going great for you. As you pointed out I see a strong influence in this latest version of Crash. If VV contacted me for some input I would've helped them refine the design. In any case I'm happy to see Crash out and about again. It's all good as they say. Why not do your own version and let's see what you come up with. On the subject of Crash, I've been wanting to ask a question about his sister! Most of the female bandicoots (like Tawna) have these little fluffy tails that match their hair, so why doesn't Coco have one? Hello Hannah. I don't know why Coco has no tail. That was a decision that Naughty Dog made. Coco was something of a departure from where we were stylistically on Crash. Keep in mind that Crash has no tail either so since they're related maybe that had something to do with it. I took a bit of inspiration from your style and added a bit of my own. Very impressive Pat! I see a lot more of you in the Crash drawing than I do of myself but if I had an influence in it then all the better. You're a talented artist. Keep up the nice work. Hi mr. Zembillas, love all your Crash drawings as always, the second one is the most interesting to me because Crash usually has a big smile on his face in your drawings, so seeing him with a different, more confused expression is interesting! Also I thought you would find this interesting: https://www.youtube.com/watch?v=11VAuAwIZAI It's the trailer to the new Crash Remastered game! It looks great in my opinion, some stuff looks a little off, like the temple levels being more colorfull and not as dark and scary as the PS1 version and Crash looks too fuzzy but overhall I think it's amazing. What's your opinion about all this? Hello Gabriele! I'm excited about the trailer for the remastered Crash. I agree with you it's amazing. Diggin the character line up too. Thanks for posting the links. Great to see this happening.